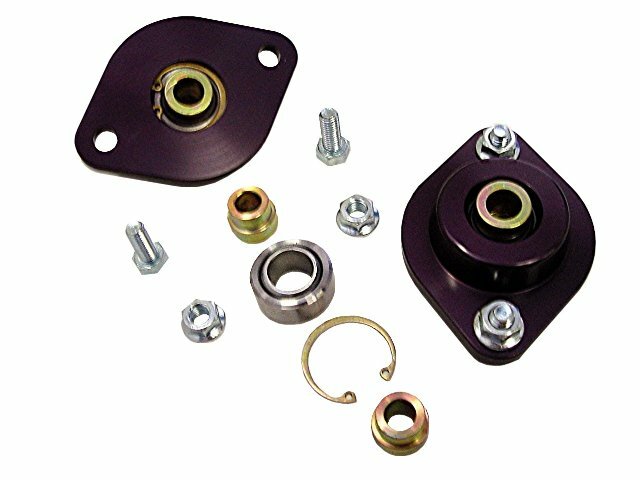 This VAC Custom Valved Double-Adjustable Damper Kit will improve the ride and handling of your Sports or Racing E30 tremendously. Koni's offer fantastic performance-to-cost ratio and they are used on many of the worlds finest automobiles as original equipment, and on racing vehicles. They can be re-valved to suit your needs and are rebuildable. Koni's are simply an excellent value. This set is pre-valved for serious enthusiasts and racers. Not to be confused with off the shelf front inserts, or Chevy Camaro or Ford Mustang rears, these DA dampers are specifically tuned for the E30 chassis. Both front and rear shocks have external-compression and external-rebound adjustments on the shock bodies for fast, efficient dialing in. They are a fantastic match and work wonderfully with plenty of much needed stroke on a slammed street car or dedicated track car. Notice the difference between standard length and the short-stroke dampers; they offer reduced ride height with out loss of compression stroke. 1) These dampers are custom valved by TC Kline, master Koni tuner and BMW road racer, for excellent performance. 2) The front dampers are short-stroke, so they are built for coilover conversions. 3) Ideally accommodates rates of 250-550in/lbs in front and 400-700in/lbs in rear. We have seen gains of 1 to 2 seconds per-lap with these dampers as a direct replacement with no spring change. Helps the driver control the attitude and traction of the car both for different spring rates, and driver preference, as well as over different quality road surface. 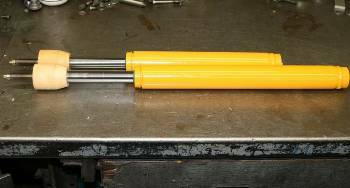 -Rebound adjustment is located on the bottom of the shock, a hole should be drilled in the bottom of the knuckle to access this adjuster. -Only available in Short Stroke front length. (See the difference shown in image.) The front strut tube/ knuckle should be cut, and shortened to accommodate the front shocks. This requires welding skills, and professional installation ability, as well as camber plates to accommodate the Koni shock. If you are not capable of doing this conversion, we recommend you ship us your front knuckles (standard or M3) and we can perform this conversion for you. -If you chose to run the front struts with a standard length tube (such as to use this kit with a direct replacement spring set) you must fashion a steel spacer spacer to reproduce the full length shock. We do not offer this item. Dampers are probably the most dramatic improvement in a suspension system. The quality of, and ability to tune these dampers let you obtain far greater performance than possible with standard suspension and makes a coilover conversion with these shocks a huge upgrade for the E30 chassis. From James C. of Rochester, New York on 4/23/2010 . When running full length or sport springs, chose the VAC Spacer kit. Now you can have Koni DA's with your choice of sport springs!